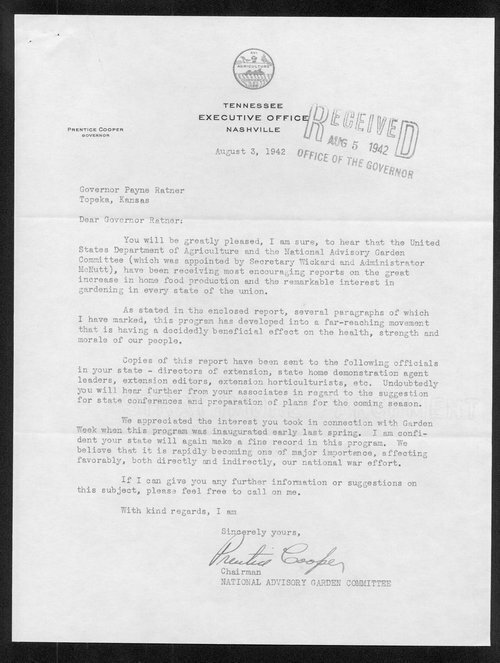 Correspondence from Governor Prentice Cooper of Tennessee to Governor Payne Ratner of Kansas addressing the spread of Victory Gardens throughout the U.S. In the letter, Cooper, Chairman of the National Advisory Garden Committee informs Ratner of the progress of the campaign. Correspondence includes the "Report of the National Advisory Garden Committee," dated June 30, 1942.